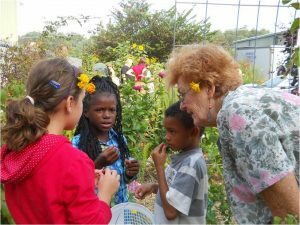 Extension Master GardenerSM Volunteers of Buncombe County are happy to announce that, for the twelfth straight year, we will be offering School Garden Grants to Asheville City and Buncombe County public schools, including state charter schools. Children sample their school garden produce. We provide a copy of the grant application form along with instructions to all school principals, elementary through senior high. Additional information is available on our website page, 2019 School Garden Grants, where you can learn more about selection criteria and download copies of the 2019 School Garden Grants Application and Guidelines for 2019 School Garden Grants. Completed application forms will be accepted beginning February 1, 2019, and no later than 5 p.m. on March 1, 2019, at the Buncombe County Extension Office, 49 Mount Carmel Road, Asheville, NC. If you have any questions, please call 828-255-5522. We are proud of our partnership with Asheville City and Buncombe County Schools. Since 2007, we have awarded 44 School Garden Grants totaling over $30,000. Our records show that these grants have involved more than 16,500 students and hundreds of teachers, parents, and community volunteers. Announcement written by Nancy Good, Extension Master GardenerSM Volunteer.